A stylized photograph of a soldier in Vietnam looking into the camera; a colorful illustration of an astronaut meeting with an alien paramour; a powerful message of body autonomy; a wistful drawing of a traveling woman looking into the sunset. 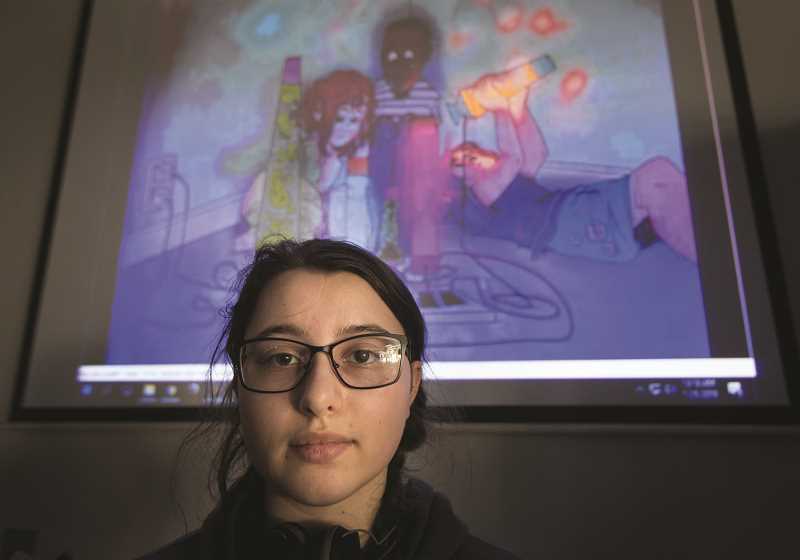 The local honorees in this year's Oregon Scholastic Art Awards are as varied as the student body itself at Woodburn High School. The Woodburn Arts & Communications Academy garnered 233 awards across 65 students in the highest art awards a high school student can achieve at the state level. 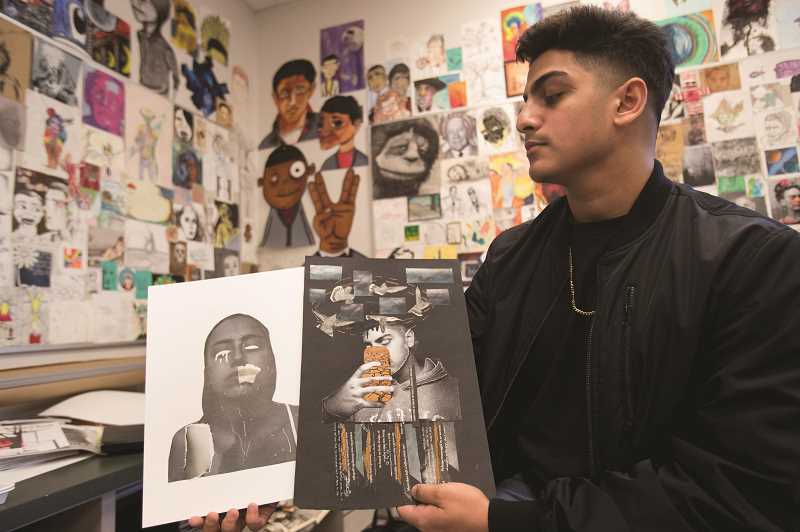 Senior Aaron Sanchez was one of 19 WACA students to earn a Gold Key award — the highest honor given by the Scholastic Art Awards. In fact, he won nine Gold Keys across a portfolio of mostly mixed media, as well as photography and drawing & illustration. In total, Sanchez was the school's most decorated artist, pulling in 17 Silver Keys and 12 Honorable Mention awards, as well as earning a Silver Key for his portfolio. 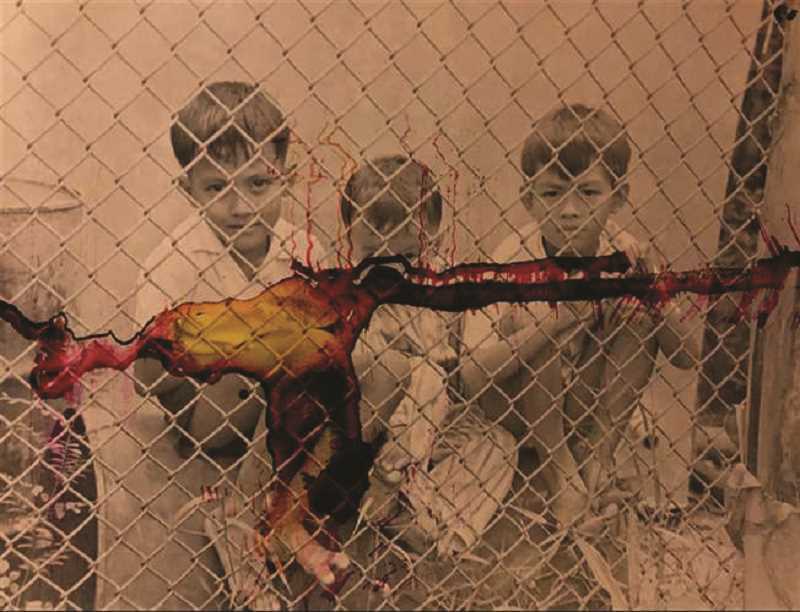 Working mostly with photography, Sanchez's work largely explores his own experience growing up with insecurity and how he used artistic expression to both convey his feelings and embrace them. "I wanted to show throughout my series of art, overcoming insecurities and facing poverty sometimes," Sanchez said. "Just all the inner securities that shape you as a person. You figure out who you are by facing all these challenges and all these insecurities you go through." Through his art, Sanchez leaned on these anxieties he had. Instead of rejecting these insecurities he had growing up — things like growing up in a low-income community, the pressure of job hunting as a teenager, and discovering his own identity — and he used them as inspiration for his work. "Once I started finding my way through out, I realized it was a story," Sanchez said. "The worst — the insecure things about myself and the loss of identity — it transformed into a story. I embrace it now, and I'm glad I went through insecure moments, because I know how to deal with it now. His award-winning senior portfolio explored a different life, that of his great grandfather who served in the Vietnam War. Though his great grandfather lives in Chicago, he had taken a number of black and white photographs during his service, which Sanchez found in his family's basement. "I went down one day and brought them out," Sanchez said. "I was just so fascinated by these moments that he captured and no one else has seen." Though relatively mundane, the pictures showed a glimpse into a life and a world that Sanchez had little exposure to. Children crouched on a street, a soldier at work, a gun, his grandfather. Sanchez took the photos, added ink splotches to them and double exposed them, adding a watery colorized element to the pictures that further accentuated the grittiness of the scenes displayed. "I added the ink to reflect the way they were living. Sometimes it was relaxed, but sometimes It was serious," Sanchez said. "I wanted to convey having those fun times, but it's a balance between being dangerous, but also a source of comfort." 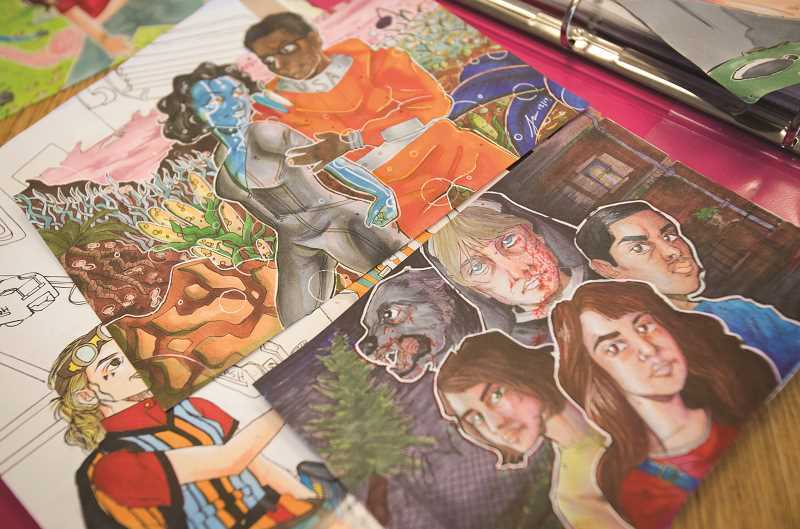 In near direct contrast to Sanchez's work, the Gold Key portfolio of senior Jordan Mann is vibrant and colorful. Titled "Adventure Has Arrived", Mann's illustrations move between fantasy and reality. Inspired by pop culture, Mann's drawings move between space fantasy, superheroes and the prehistoric, creating scenes between characters where the audience is invited to fill in the details. "You create your own story almost," Mann said. "You look at this one, then look at that one and make your own story." In one drawing, a man in an orange space suit is standing amidst a rocky landscape holding a retro-futuristic laser pistol. Mann said she was inspired by Star Wars, using actor John Boyega as a reference and drawing him in a style similar to what was displayed in an old book from the 1950's that featured space fantasy. In the next picture, he is embracing an alien woman similar to that of Karen Gillan's character Nebula in the Guardians of the Galaxy films. "I think she's really cool and I wanted to make my own," Mann said. "Since this guy was from the '50s, I wanted to give a vibe that she was old too, so I gave her a Marilyn Monroe hair style and thin eyebrows." Whereas Mann draws from pop culture, Ari Macrum finds inspiration closer to home. "I really like to draw from my own body, so I take pictures of myself and I draw what I see," she said. Macrum won two Gold Keys, eight Silver Keys and 11 Honorable Mention awards. Her two gold pieces titled "Dream" and "Not Yours" explore themes of beauty and body autonomy, drawing using one line and never picking up the pen. "I've actually had a lot of experiences with people placing my worth solely on my body," Macrum said. "I just wanted to get those feelings out, so I had this gesture and I put 'not yours' because, 'not yours'." The oldest of seven siblings, Julia Melkomukov draws her inspiration from her family and childhood, using her life to explore whimsical fantasy. "How my sister likes to define me is childish and immature, though I like to disagree that I think immature and childish are two different things," Melkomukov said. She won three Gold Keys, three Silver Keys, nine Honorable Mentions and received Honorable Mention for her portfolio. One of her Gold Keys, titled "Sweet, Sweet Cannibalism" features a colorful Jack-O-Lantern bundled up in warm clothes and sipping a pumpkin latte from a plastic cup. Another, called "Wavy Blinds" is a mix of pen on paper that she colorized and worked on her phone, showing window blinds transforming into ocean waves. But her favorite pays tribute to her mother. "She always wanted to travel, but due to her circumstances in Russia — she wasn't able to go to much high school, she was married off at 21, and she has a bunch of kids." Her piece, "Leaving With a New Friend," is the third in a series of a backpacking woman discovering green hills spotted with tiny lambs living in dog houses. After sitting down for lunch in the second drawing, the woman adopts one of the animals for her own, which sits snugly on her shoulders as she looks over the landscape at the end of the day. 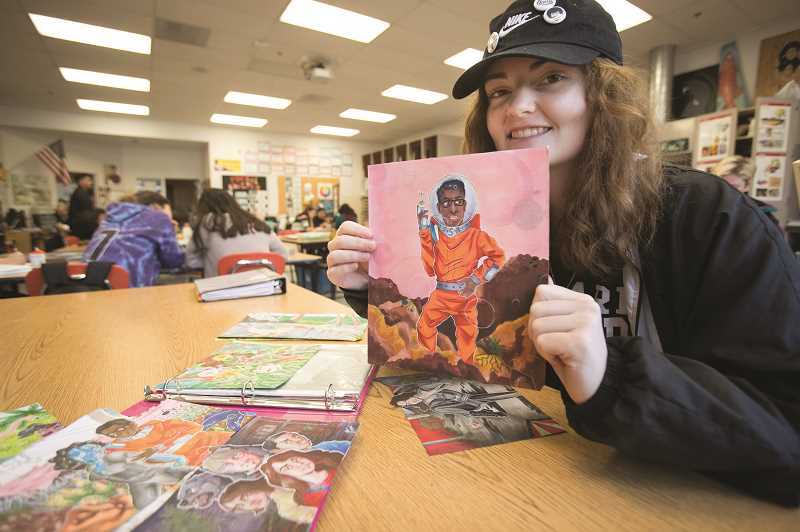 Between the classrooms of Catherine Johnstone and Jefferson Cook, dozens of students across Woodburn High School have been recognized in this year's Scholastic Art Awards. "I'm just really thankful to work in a district that supports art so much," Johnstone said. "The small schools have been awesome. We love that there's a culture of art already built into the school." A full list of the award winners will be available online (littlebirdarts.org), while the Gold Key recipients will be further recognized at Oregon State University's LaSells Stewart Center later this spring.